Recording the screen activity may be tough for most people, and many people do it for research or review purposes. So, we have the latest tool out in the market, and it is excellent. Many of you must have tried to record videos of your activity of your phone or desktop. On desktop it is pretty easy, but for everyone, recording the screen on your smartphone is a tough job. Till now, you must have come across many apps on the Play Store which let you record the screen activity on your Android smartphone. But, most of them require root access. So, like you need to record something important suddenly, and your phone is not rooted. That is kind of a big problem. But now, there is a solution for those who have got or are about to get the Android 5.0 Lollipop update. This is new featured called Android Media Projection, which has been iintroducedin Android Lollipop. Till now, you could record using USB and ADB, along with root access, but now you don’t need to face all these hassles. The new API works out of the box and opens the screen recording feature to non-root devices. 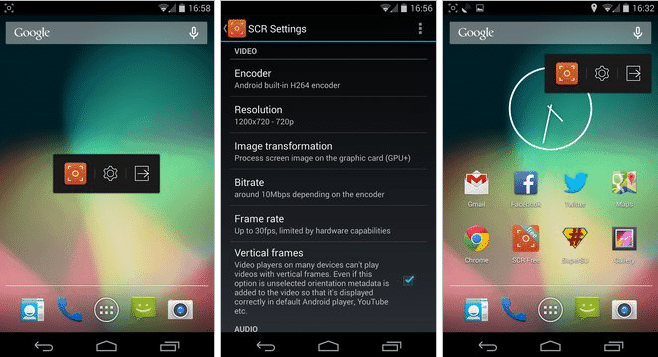 Now, the best app out in the market is SCR Screen Recorder which will enable you to record the videos of your sessions on your Android smartphone. And all these, without any root access. Just you need to install the app and start recording. There are two versions of this app- SCR Screen Recorder Free and SCR Screen Recorder Pro. Using the free version you can record a video up to 3 minutes in length and there will be a watermark, but with the SCR Screen Recorder Pro you can record as long videos you want, without any watermark or any limits.